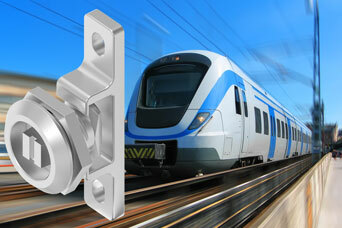 Our new Program 1000 stainless steel quarter-turn latch uses an externally mounted C shaped catch and insert type spanner lock in conformity with RIC for Railway use outside the sealing gasket on enclosures and cabinets. By mounting outside the cabinet frame and outside the gasketing area, panel builders may be confident that the lock installation ensures integrity of the housing as the sealed area is not compromised in any way. The Program 1000 can be varied in format by using other types of quarter-turn or compression latch where required, perhaps for non-rail applications such as food industry where a suitable latch/lock can be selected. Rail industry conformity may be further addressed by use of a fire protection gasket sealing profile such as 1011-05-FR01 in the knowledge that there are no other vulnerabilities. Share the post "New Stainless Steel Railway Catch"